A few years ago, I was pulled over for going 61 miles per hour in a 55 miles per hour zone. I mumbled and grumbled to myself as the officer went back to his car and wrote me a ticket. Instantly, over $100 went down the tubes, and that doesn’t include the bump in car insurance rates. Sure, the officer was probably filling a ticket quota. That doesn’t change the fact that you can get hit with a speeding ticket at any time if you’re going over the speed limit. Add on top of that the fact that most cars use fuel most efficiency when going at about 55 miles per hour, and a plan for cost-effective driving starts to become clear. Stick to the speed limit as much as you can. So, let’s examine a car that gets 20 miles per gallon when you drive optimally. Let’s say you’re going on a 180 mile trip, meaning you’ll normally gobble up nine gallons of gas if you’re going 60 miles per hour. Turn the speed up to 65 miles per hour and you save about 14 minutes. However, you’re eating up $2.52 in extra gas. You’re essentially saving $10.80 per hour – and that’s after taxes – by driving 5 miles per hour slower. That’s just counting the fuel efficiency part of the equation. 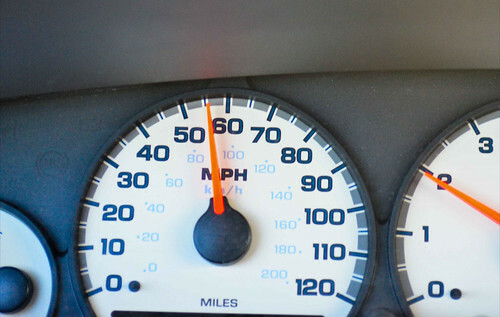 On top of fuel efficiency, you have the risk of getting pulled over if you’re going over the speed limit. Getting a ticket is something of a random event. You could speed with reckless abandon and not get a ticket for years, or you could get two tickets on a single three hour road trip (I’ve seen it happen). When you get a ticket, not only will it cost you a significant amount for the ticket, it will also have an impact on your future auto insurance rates. $10.80 per hour is a severe underestimation of your savings from keeping your speed under control. The challenge I have with securing this savings is that… well, I tend to have a lead foot. If I’m driving along a boring two lane road or a long stretch of interstate, I tend to gradually go faster… and faster… and faster. My solution for that is to simply use the cruise control. I turn it on for every flat and straight segment of road I’m on. I flip it off for significant curves or significant hills, as I slow down for the curves and uphill segments and allow myself to pick up that speed again when going downhill. The savings I rack up from simply keeping my accelerator under control – the gas savings, the maintenance savings, and the avoidance of speeding tickets – makes it well worth the extra few minutes spent on the road.